Others, more up-to-date on metal style tags, will have to fill in here to explain exactly what Djent metal is. That is what Israeli Shiran play, but I will just call it modern, trippy, somewhat progressive, and definitely radio friendly metal. Rhythmically choppy and syncopated, that is the first inkling I got from Shiran just listening to the opener Remain. Somewhat dark, but commercially so, this is the music which targets wider acceptance and hopes for more radio play, than it is to appeal to the underground lonely listener, which makes it not entirely my cup of tea. 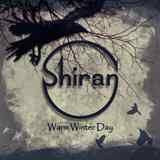 Fronted by Shiran Avayou, the other comparison compositions from Warm Winter Day conjured were a little bit more rocking and slightly deeper accented recent day The Gathering. Definitely less atmospheric, and more riff oriented. With a capable, somewhat boyish demeanor, Shiran does nothing to detract from the experience, but she is not vaulting my impression of the band over the top either. The band is otherwise made up of the musicians from Ferium, another Israeli band I am not familiar with. The guys can certainly deliver riffs with jazzy accents, have an ability to stay tight and managed to book a studio with good production quality. When drama is borne out of the heavy chug and the soaring chorus follows (title track) my attention was peaked, but if chug remained just that (Burden’s Off), the experience was less impactful. Similarly, when mid-Eastern melody (The Child) took Shiran closer to their geographical roots, and the restless bass rhythm made the verse more interesting, I found myself liking the song. So, while having nothing truly negative to say to describe Warm Winter Day, I can recommend it more for people who listen to radio rock with heavy guitar sounds and thus think they are much more extreme in their music tastes than their friends who can’t fathom any weight and distortion in their music.